Widely called ‘pitcher plants’, Nepenthes are but one of the carnivorous plants that take this common name. Plants from species such as Darlingtonia, Sarracenia and at least one Australian species, Cephalotus follicularis are also represented, grown not only for fun, but also as a fascinating hobby for collectors. Nepenthes are the largest genus and most are the climbing or ‘hanging’ pitcher plants (see picture right) mainly from South East Asia including islands such as Borneo, some are from Northern Queensland. 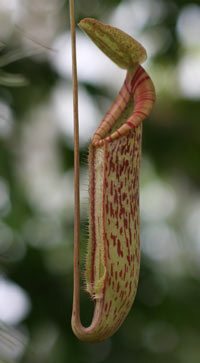 Species include plants such as Nepenthes attenboroughii, N. ventricosa and N. mirabilis, some of the best known of what we commonly refer to as ‘pitcher plants’. Today many of these are sourced from tissue culture laboratories. These carnivorous plants are popular with collectors and gardeners alike. Nepenthes truncata is originally from the Philippines, fairly easy to grow and a real eyecatcher. Nepenthes rajah is an example of a highland species, these generally require cool night time conditions and warm days, conditions that are not easy to replicate. Valued for its large pitcher and huge lid, well worth a try if you have a greenhouse or live in the mountains in QLD. How to grow Pitcher Plants. Growing conditions for Pitcher Plants vary greatly depending on species, some are easy care, other require very specific conditions. Be sure to get a fact sheet that is relevant for your specific type. Light, Moisture, Temperature and Humidity are the main factors and these do vary according to species. The growing medium and the fertiliser or nutrients supplied are also important factors. Light influences the size and colour of the Pitcher itself, a general rule is around 50% shade cloth, although in some climates, 80% may be required. The length of daylight hours will also influence growth, short daylight hours will lead to slower or stunted growth. In general all varieties require watering on a regular basis, they do like a well drained environment, but do not like to dry out. It is best to use rainwater, tap water should be allowed to stand for 12 hours and also allowed to increase in temperature to room temp. All species and cultivars perform better in a humid environment. However poor air flow and high humidity can lead to fungal problems. Moist growing medium is often enough with occasional mist spraying during the warmer months. Long cold periods are not suitable, although these are a generally adaptable plant. Try for 15C to 30C daytime temps, 10c – 15c nighttime. Nepenthes ‘natural fertilizer’ is insects and this is generally enough. Do not feed pitcher plants meat or similar. A little liquid fertilizer in the potting mix once a month will help. Nepenthe truncata – This is a very large growing species with the ‘Pitcher’ reaching 30 – 50 cm in length. Green pitcher and ochre/red lips. Best grown in warm climates with high humidity. One for the tropics unless you have a greenhouse. Two forms are available, a highland form and a lowland form. The highland form copes with cooler temperatures and less humidity. Lowland forms are best in a temperature range from 27C to 35C with a night temperature of 15C. Nepenthes can be grown from cuttings, tissue culture or from seed, many hybrids are now becoming available some with huge pitchers. Nepenthes lowii, sumatrana, belli and burbidgeae are all popular candidates for hybridisation.